Whether your dental needs are a complete exam and cleaning, a full-mouth restoration, or anything in between, we promise to provide you with exceptional care as we enhance the natural beauty of your smile. 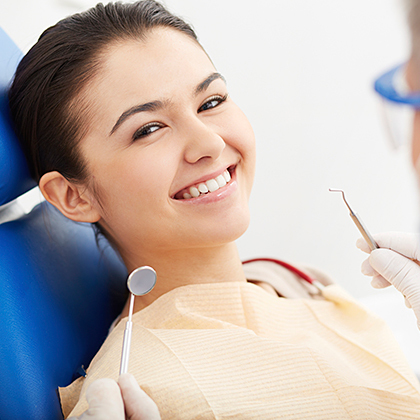 At Now Dentistryyour smile is our first priority, and we'll give you something to smile about. If you have any questions, concerns, or would like to schedule an appointment, please contact us today at 410-999-1111. We look forward to providing you with the personal care you deserve. Virtually all medical and health care settings are taking advantage of modern technology to improve patients' experiences, and our practice has joined that trend as well. Modernized treatments like dental implants and Invisalign, which improve on earlier interventions, benefit many of our patients. More advanced tools also help us take better care of our patients. Many of these tools are used for both basic dental care and more advanced interventions. One example of this is our intra-oral camera, a tiny powerhouse that captures images of the entire interior of your mouth. The images are available for view immediately on our computers, and our dentists use these pictures as a tool to educate patients and engage them in their treatment plans. Our goal is to help you feel and look your best while focusing on your long-term dental health.Now Dentistry offers a full range of dental services with a consistency in quality that your family deserves. Dental implants are often the best treatment for missing teeth. When a damaged or decayed tooth is removed, both the visible part of the tooth, called the crown, and the root are lost. They will allow you to confidently eat, smile, laugh, talk, play and enjoy all of your regular activities of everyday life without thinking about your teeth.